What Will Your Landscaping Cost? You can easily create a landscape within your budget once you know the landscaping cost of each part. Projects can range from the affordable to the very expensive. Use this pricing information below to get an idea of what the project you are interested in will cost. This way you won't be shocked later! If it is becoming too expensive, there are ways to adjust different parts to make it work for you. 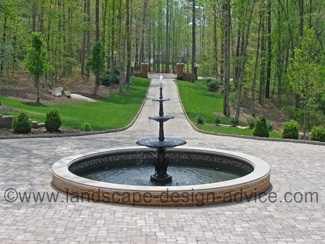 I often do this for clients, and you can still have an outstanding landscape design. You might only be interested in some of these landscape features, or you might be interested in a complete landscape. Here are some things to keep in mind. 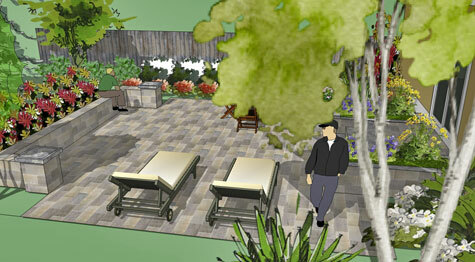 A landscape design can be implemented in stages so that it is more affordable. 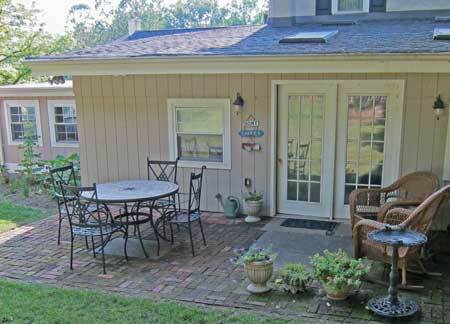 Reducing square footage sizes of patios and walkways will cut down on costs. Change a material to a less expensive one. The design is more important than the material itself. Start with plants that are one or two sizes smaller than you would like. They will grow and you will hardly remember! Here are some examples of what you can expect to pay for some landscape elements. These will vary depending on where you live, the expertise of the landscape contractor, the economy, etc. If you were to visit a garden center and purchase a plant, you would pay the retail price the nursery is selling it for. Although landscapers purchase plant material at wholesale or discounted prices, typically they will charge you close to the retail price. In addition, most landscape contractors add on between 40% and 60% for installing the plants. This is their labor charge. Sometimes it will be itemized on a proposal and at times it will be included in the plant prices. There is a wide range of costs, depending on the type of plants. 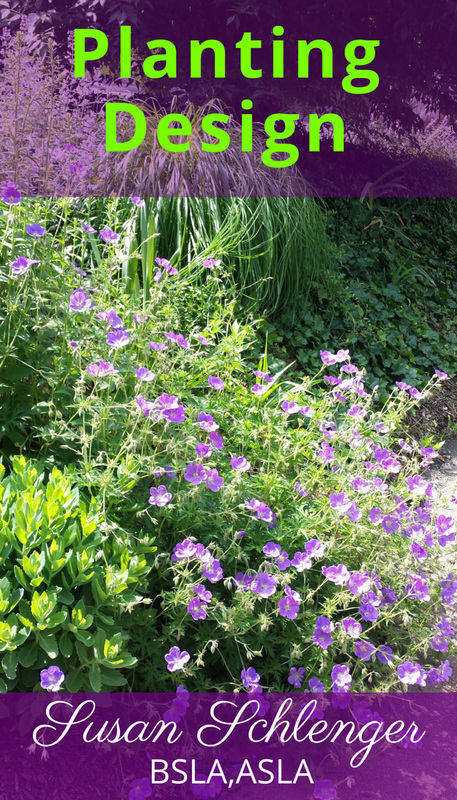 Perennials are less expensive than other plant material. Deciduous shrubs and evergreen shrubs are more expensive than perennials. Evergreen shrubs are often, but not always, more costly than deciduous shrubs. Trees are usually the most expensive type of plant. In addition, the quality and sizes of any of these materials will determine pricing. Larger trees are more expensive than smaller ones. Higher quality trees are more costly than poor specimens. This is why when you are reviewing proposals and looking at the landscaping cost, you have to be very careful to compare apples to apples. You might pay a retail price of $150 to $200 for an average tree. If you go to larger more established trees of high quality, you can expect to pay $300 to $600. There are some that are even more expensive. In addition to these sample plant prices, there are the labor costs. So you can see how prices and your landscaping cost for a planting design can add up. Also, some landscapers charge for additional topsoil or soil amendments, while some include it in their pricing on the proposal. The cost for mulch is an additional item. Mulch amounts needed and costs are typically calculated by taking the square footage of your planting bed, multiplying that number by .25 (which equals a layer of mulch 3" deep), and divide this number by 27. This will give the number of cubic yards of mulch needed. Mulch can run $75 per cubic yard or more (installed) depending on where you live and the quality of mulch. Hardwood shredded bark is one of the nicer mulches. It is a rich, dark brown color and is nicely shredded to give an attractive consistency. Lawn repair or new lawn installation is often part of a landscape project. A thin 1" to 2" layer of topsoil should be added. You may use grass seed or sod, which will provide an instant lawn. Sod can be twice the cost of grass seed. Once again, lawn repair or new lawns are based on square footages, so the larger the area, the more costly it will be. Patio designs can have a huge range in costs. 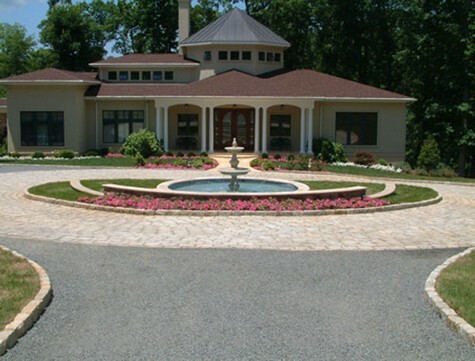 The paving material you choose will greatly affect the landscaping cost. Concrete, concrete pavers, travertine pavers, bluestone, or other natural stone can range in price from approximately $7 per square foot up to $30 or more. Materials set in concrete are even more costly. These prices include labor. The size of the patio will be part of the landscaping cost factor. The larger the patio the more expensive it will be. However, sometimes you will get a less expensive material price per square foot for larger spaces. You might also have special features as part of your patio design, such as seat walls, circle kit designs, an outdoor pergola, or built in planters. All of these special amenities will increase the patio costs. Seat walls are priced by the square footage which is determined by the height times the length of the wall. Another 6" or so is added on to the height for the burying of the wall beneath grade. Retaining walls hold soil on one side, and you do not pay for this face of the wall that you do not see. Free standing seat walls have two sides, as opposed to retaining walls which have only one side. Both sides of a free standing wall are figured into the square footage. The square footage of a wall is multiplied by the cost per square foot of the specific material to come up with basic costs. There also might be additional needs, such as special grading, drainage, etc. Cuts in the land or fill might also be required, adding on to the cost of landscaping. 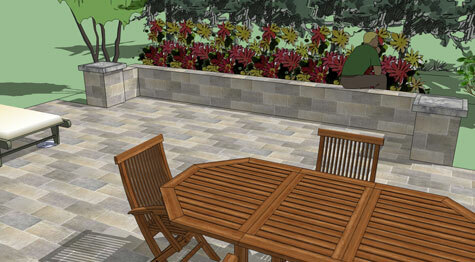 A decorative concrete block wall will be less than a natural dry laid stone wall. A mortared stone wall will cost the most. 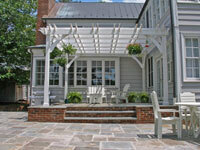 Outdoor pergolas, providing shade and beauty, will be another cost. 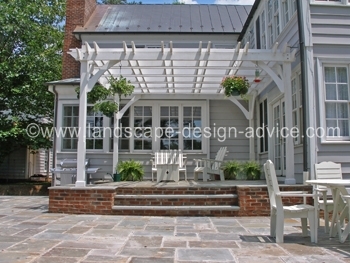 A typical pergola might cost in the area of $8000 to $10,000. 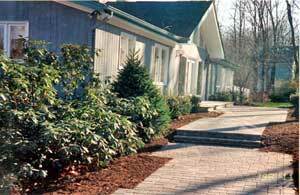 Walkways are also priced according to square footage and the particular paving material used. 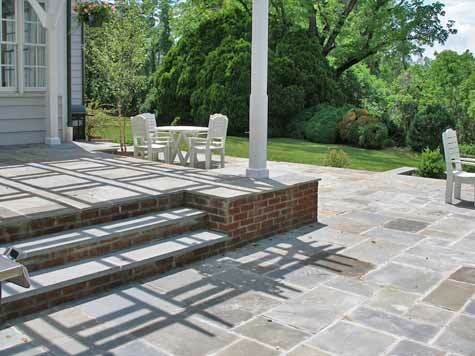 Steps are an additional cost, and can add on a significant amount. Some other things that might affect the landscaping cost would be additional items such as an outdoor gazebo, a pond, a swimming pool, arbors, driveways and fencing. Ponds are priced according to their size. If a waterfall is included, this is also considered. A typical pond of an average size with a waterfall will cost in the area of about $8000. Of course, ponds can be very large and intricate. The smallest pond I designed was about three feet by five feet. The cost was $3500. Fencing is priced per linear foot and the particular material used. One of the less expensive materials is black vinyl chain link. You can expect to pay about $10 per linear foot for this. By the way, fence pricing I am mentioning includes labor for installation. On the higher end is the aluminum residential fence. This will run around $30 per foot. Gates are extra, often around $300 per gate. Landscape contractors will put all the parts of your landscape project together to come up with a proposal for your landscaping cost. So how can you cut down on the landscaping cost if it turns out to be way over your budget or more than you want to spend? Well, there are a few ways to accomplish this. You can keep the integrity of the planting design, but reduce the size of the plants. It might take a little longer for the plants to attain their mature size, but you will still have a great project. 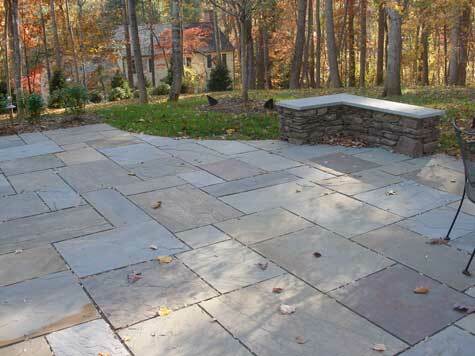 Revising your paving material choice will also help reduce the landscaping cost. For example, a concrete patio design, is about half the price of concrete pavers. Reducing the patio size will probably not amount to that much of a savings. Hold off on features such as gazebos, pergolas, seat walls and ponds. A project can be designed so that these features are optional, allowing the design to work well with or without them. If you want to cut down on your landscaping cost, it is better to take some or all of these approaches, rather than compromising the design. In the end you will have a better project. Find out more about what actual parts of a landscape cost. Plants, different paving materials, steps, pools, ponds, lighting, and more are all listed along with many of my project photos to show examples. This book is helpful to both homeowners and landscape contractors. Discover the real costs of landscaping!